Thank you for visiting our Delaware Dealer's Listing! Please support the local economy. AMSOIL is the only true "Consumer's Oil Company" designed with your pocket book in mind. If you plan to use AMSOIL often or use it exclusively you are better off joining as a Preferred Customer. Please mail or fax in our Preferred Customer Form with the Preferred customer portion filled out. It's the best way to buy and save money. You can also upgrade to a dealer later if you start getting inquiries. We can usually have your item shipped to you much quicker than it takes to hunt for a closer dealer if you are outside of the area, then have to wait for them to update their stock. Please contact the dealer listed to the right. Serving the following general areas: Delaware (Delmarva Peninsula); Seaford, Laurel, Bridgeville, Selbyville, Millsboro, Dover, Wilmington, Newark, Smyrna, Harrington, Georgetown, Bethany Beach, and Fenwick Island. Maryland; Pokomoke, Princess Anne, Salisbury, Hebron, Sharptown, Berlin, Cambridge, Hurlock, Federalsburg, Trappe, Chestertown, Annapolis, Baltimore, and Washington D.C.
We represent the largest group of dependable dealers and the top 20 in volume in the US. We can meet any need. Call us or order directly online from the AMSOIL HQ. The Dover - Cambridge area is one of the fastest growing AMSOIL Markets. We are having our products stocked in more stores. Please enquire or call to order and pick up in any quantity. All our local dealers look forward to doing business with you. For populated areas this region has the lowest dealer to customer ratio so please consider joining us as demands keep increasing. AMSOIL dealers supply unique lubricants to ATV, marine, motorcycle, diesel, manufacturing, construction, freight companies and more. Additionally if I should happen to not have your selection in stock, shipping is sometimes more convenient as it's usually only a day to the area from the Richmond or Lancaster Distribution center. Delaware has excellent pricing too with great shipping rates. Please enter the main site for more information or simply call 302-629-9447. Should you have multiple vehicles or need to order frequently, be sure to print and complete the Preferred Customer or Dealer form. This gives you the benefit of ordering direct at the wholesale price while having hard copies of all the materials and our monthly AMSOIL Magazine to keep you updated on our product innovations and offers. AMSOIL - used by the greatest teams of racing, Other brands may fancy up the skin with their logo but that is not what's used under the hood. Experienced teams in the public eye know AMSOIL results in greater dependability. WE SUPPLY Quick Lube shops!! But the core of our customers are average commuters and commercial businesses looking to cut costs in fuel and average vehicle life. AMSOIL Synthetics is known for it's ability to reduce downtime and serious costly mechanical failures in all applications: Automotive, Heavy-duty Equipment, Compressors, Lawn and Golf Course Equipment, Marine, Motorcycle and more. When using AMSOIL, be sure to check out the By-Pass filtration systems. Many would find it difficult to believe but this system typically allows oil change intervals to exceed 100,000 miles when using AMSOIL. We have several different kits for all vehicles, both diesel and gasoline. These have a proven track record with passenger cars, light & diesel trucks, school districts, trucking fleets, and all marine applications. Your Delaware dealer now have many kits for all vehicles, both diesel and gasoline. These have a proven track record with passenger cars, light & heavy duty diesel trucks, school districts, trucking fleets, and all marine applications. The bypass filter is a 60,000 mile filter now. You simply change filters when needed and top off with oil. As long as you are using AMSOIL engine oils, the oil will remain below oxidative levels and pass for continued use. The new EaPB filters remove everything over 2 microns! As you look through the site please ask for your free AMSOIL catalog before leaving. Save even more with our new (EaA) - absolute efficiency nanofiber air filters guaranteed to last 100,000 miles or 4-years. At one year or 25,000 miles the AMSOIL (Ea) air filter can be cleaned by compressed air or vacuum at the same time as your oil change helping you consolidate maintenance. NO OIL NEEDED! This reduces your filter costs to about $9 per year rather than buying a new cellulose air filter every 10,000 miles. The new AMSOIL Ea Air filter is OEM Certified for fit and warranty compliance. Our oil filters are guaranteed in gasoline engine applications for up to 25,000 miles or 1-year. So just 2 oil filters, a case of the Amsoil ASL or ATM synthetic engine oil to cover most vehicles for two years and an air filter to reduce normal air filter purchase by 1/8th. All products are produced in the USA. Also contact us for all your 2-cycle, racing motor oils, transmission gear and hydraulic fluids. For watercraft our Interceptor 2-cycle injector oil is one of the best selling items in the industry. Great for Sea Doo. Clean power valve operation for less cost. AMSOIL Synthetic Motorcycle Oils not only provide superior protection for motorcycle engines, they also provide superior gear protection, meeting API GL-1 gear lube viscosity requirements. AMSOIL Synthetic 10W-40 Motorcycle Oil (MCF) meets SAE 80W-90 gear lube requirements, while AMSOIL Synthetic 20W-50 Motorcycle Oil (MCV) meets SAE 90 gear lube viscosity requirements. As you will see in this website AMSOIL produces the most energy efficient hydraulic and compressor oils available and a warranty as strong as steel. If you rely on industrial lubricants, we have what you need. We can assure you that our product offers the lowest cost per use available on the market. Yes, it cost less to use synthetic lubricants, and in industrial and fleet situations the savings are often in the tens of thousands. AMSOIL 10W-30 Formula 4-Stroke® Marine Synthetic Motor Oil (WCT) is a premium quality synthetic formulation engineered for the harsh operating conditions of marine environments. It withstands the intense mechanical action of continuous, high RPM operation to deliver superior viscosity protection. Formula 4-Stroke® Marine Synthetic Motor Oil is specially fortified with a heavy treatment of advanced additives that protects motors against wear, rust and deposits. It excels in both high horsepower applications and all-day trolling conditions. This new 4-stroke outboard engine oil is NMMA Certified and is the best product for engines under warranty. Please examine this and other synthetic marine and gear oils in our Marine area. Local Seaford Delaware demand has created a great need for AMSOIL dealers in this area, especially in the outlying areas and in the suburbs. You get excellent support from myself as I am part of one of the most resourceful AMSOIL dealer groups in the country. We can send local and web generated leads your way. The #1 question we get from local customers is, "Where can I find AMSOIL here in Dover." or any other city. Our distribution center can quickly have your product anywhere whether you need 2-cycle for your dirt bikes or ATV oil, or if you have a weed eater you need to last in the hot & humid seasons of Delaware. Diesel engine emissions have been an ongoing environmental concern for the past few decades, and the United States, Europe and Japan have responded to demands to reduce harmful particulates and nitrogen oxides (NOx). In the U.S., particulate and NOx levels were first regulated in 1988, with regulations becoming increasingly stringent through the years. In fact, 1988 standards set NOx and particulate levels at 14.4 g/kW per hr (grams/kilowatts – hour) and 0.8 g/kW-hr respectively, while 2010 standards have been set at 0.27 g/kW-hr and 0.013 g/kW-hr respectively. By 2010, diesel engines will be considered “clean,” but getting there will require sulfur-free fuel, improved in-cylinder combustion, exhaust after-treatment, vehicle design changes and diesel oils that are compatible with after-treatment systems. Between the years 1988 and 1991, emission standards were met by improving in-cylinder combustion through the use of unit injectors, electronic controls, controlled air swirl, improved combustion bowl design, reduced piston crevice volume, turbo-charging, air inter-cooling and reductions in oil consumption. The year 1991 also saw the use of high top rings to lower particulate emissions. By 1998, retarded fuel injection timing was introduced to meet increasingly stringent NOx emission standards. High top rings and retarded fuel injection timing increased soot loading on the oil, leading to the introduction of API diesel oil category CH-4 in order to prevent viscosity increases and increased wear due to soot. In order to meet 2002 emission standards, most engine manufacturers introduced exhaust gas recirculation (EGR) engines, which recirculate a portion of the exhaust to the engine’s combustion chamber, lowering peak combustion temperature. Although EGR engines effectively reduce emissions, they also run hotter and introduce higher levels of soot and acid into the oil, leading to increased wear, increased oil viscosity and shorter oil drain intervals. The API CI-4 diesel oil specification was introduced in December 2001 to protect against the higher temperatures and increased levels of acids, soot and oxidation associated with EGR engines, while some manufacturers released their own diesel oil performance specifications in order to assure optimum protection for their equipment. Mack released its stringent EO-N Premium Plus High Performance Diesel Engine Oil specification in the spring of 2002, then upgraded it to EO-N Premium Plus 03 in April 2003 due to soot-related oil thickening and shear that occurred after a certain length of highway time. API issued an upgrade to its CI-4 specification, CI-4 PLUS, in September 2004 in order to provide improved oxidation resistance, shear stability, acid neutralization and soot dispersancy for EGR engines. CI-4 PLUS certified diesel oils also meet most of the individual manufacturer issued specifications and are backward compatible with older diesel oil specifications and engines. CI-4 PLUS oils must first meet the original requirements of CI-4, with the additional requirements of passing the 90-Pass Shear Stability Bench Test and the Mack T-11 engine test, a more stringent upgrade of the Mack T-8E soot-viscosity test required for CI-4. In order to meet 2007 particulate standards, exhaust after-treatment devices such as particulate filters (DPF’s) and continuously regenerative traps (CRT’s) will be incorporated into diesel engines, creating new challenges for diesel oils. AMSOIL Synthetic Diesel Oils are ahead of the curve and ready to meet the challenges of tomorrow. Just what you need in Delaware! AMSOIL Synthetic Diesel Oils surpass the most stringent modern diesel oil specifications required, including CI-4 PLUS and EO-N Premium Plus 03. Formulated with top-of-the-line synthetic base stocks and advanced additive packages, AMSOIL Synthetic Diesel Oils effectively control the increased soot and acid levels associated with EGR units, while remaining shear stable at high temperatures, avoiding the damaging sludge and deposit build-up that contribute to decreased fuel efficiency, corrosion and accelerated engine wear. The drain intervals of AMSOIL diesel oils may be extended by oil analysis in EGR-equipped engines. We have many Dover customers who say they would never believed how well AMSOIL has improved their engine operation and has saved valuable time. Emission control technology has increased soot loading of diesel oils, prompting original equipment manufacturers to shorten drain interval recommendations. Even at increased soot levels, AMSOIL Synthetic Diesel Oils continue to offer outstanding wear protection. 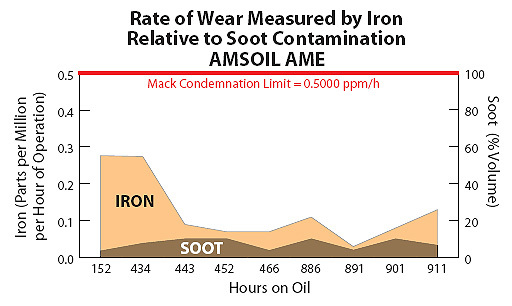 Soot and iron wear levels were measured over 900 hours of operation in a 2002 EGR-equipped Mack LE613-Rear Loader running AMSOIL 15W-40 Synthetic Heavy Duty Diesel and Marine Motor Oil. As seen in the graph, even at increased soot levels, the rate of engine wear remained well below the Mack condemnation limit of 0.5 parts per million per hour (ppm/h). With cooporation with the Lancaster, PA warehouse, our location and the Richmond, VA warehouse orders are only 3 business days or less away with impressive low cost shipping rates. AMSOIL Dealer Opportunities in 2015 provide you with the ultimate home business opportunity with over 40 years of continuous growth to back it up. These products ARE IN DEMAND! We will help you stay on course but you can become totally financially independent if you put in the effort, Call me or one of my dealers and we would love to discuss it with you. The big thing now is getting AMSOIL in local stores, independent lube centers and automotive shops. We have a successful method to secure local business not to mention the latest in shelving, display, free installer & retailer locator listings on the corporate site, personalized materials for the shop and free shipping for those who qualify. AMSOIL is the auto enthusiasts hero! And increases in advertising and regional support teams are there to make it more possible for you to reach your goals as an AMSOIL dealer. Join us every year for AMSOIL University or try the upcoming online version and get ready to tell the old boss good-bye. We can even help you open your very own Amsoil Retail Store! AMSOIL's highest demands are in both the diesel and powersports sector. We urge you to print out our Dealer Sign-up Form or even better - call us and then read more in our Dealer Opportunities section. We may also have a team of dealers close to you so call and we will forward their information. AMSOIL is becoming a household name. Customers are expecting to find it locally. Vehicle manufacturers are installing synthetic oil into new vehicles on the production line. Cars & Trucks made before 1995 need oils with more anti-wear additives and better quality detergents. Drivers discovering top quality (real) synthetics do indeed increase fuel mileage. New lubricant trends demanded by industry are developed well before the engine and transmission technologies hit the marketplace. This allows AMSOIL to further develop their product even further while the competition arrives late testing their product after the requirement goes live. New emission systems demand oils, which can take more heat and leave fewer deposits. Currently diesel engine changes have created problems which demand more stable base stocks. We have them and you save more fuel to boot! OEM Automatic Transmission Fluids are limited to light duty use. AMSOIL ATF and Low Viscosity Trans Fluid cuts temperature significantly and delivers more power to the wheels. Our transmission fluids continue to be well ahead of the industry because of AMSOIL's relationship with suppliers. They are demanding better lubrication qualities from the oil to improve fuel economy. Commercial vehicles Require synthetics in transmission and drivetrain parts to retain extended warranties. (And better power transfer). Environmentally we can not go on disposing of the millions of gallons of oil each year that is the bi-product of 3,000 mile oil change intervals - Imagine if everyone changed their oil at say 7,500 miles instead. The used oil disposal problem would be cut by 50%. Yes 50%, not just 1 or 2% - Now consider the impact of a 25,000 and beyond oil change interval. OEM fill and recommended product now from several lines such as Eric Buell Motorcycles. AMSOIL is MADE in USA. As one of the largest and fastest growing groups recognized by AMSOIL, and (we think) the most responsive, we offer the communication and tools you can use. We help the customer find you. Come visit our AMSOIL Store and see how you too can make online ordering obsolete in your area too! Why should you join our group? We are part of one of the most successful marketing dealers who specializes in finding you customers and putting you on the right track. For me it's a full time job, and we do what it takes to help people locate you. We re-distribute significant leads to those requesting them. The dealers who are easy to locate, keep some stock and follow-up on leads are the ones who are experiencing double digit growth. Use this dealer Preferred Customer link to join or CALL so we can pair you with a dealer near you. Copyright © 2000-2011 The Synthetic Warehouse. All rights reserved. All materials contained on this site are protected by International copyright law and may not be reproduced, musterd, distributed, transmitted, displayed, published or broadcast without the prior written permission of The Synthetic Warehouse or AMSOIL INC. We do check often and take action to those using our unique material. However, you may download material from our web site for your personal, noncommercial use only.